At its MAX 2018 event today, Adobe announced that it is bringing the power of desktop Photoshop CC to the iPad. The new Photoshop CC for iPad is completely redesigned for a touch-first experience and enables all functionality found in the desktop version including support for editing PSD files and layers. The app will be available for download in 2019. Adobe's MAX 2018 conference is here and as usual we got to see some of the new improvements the company is making to its Creative Cloud platform. The standout announcement today was the new improvements to Adobe Photoshop CC and more specifically, was about bringing the full Photoshop experience to the iPad. Adobe said that the idea for porting the classic Photoshop experience to the iPad was first brought about by two engineers on the Photoshop team. The plan apparently seemed moot until they reached the so called 'proof of life' moment. Subsequently, the design team evolved the UX of the app to play well with the touch controls of the iPad. Adobe demonstrated working code at MAX 2018 but the app itself will be available only sometime in 2019. Version 1.0 of the app will focus a lot on compositing, layers, transforming, masking etc. Some features such as the Timeline and keyboard shortcuts will be added in a later update. 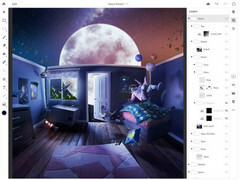 The success of Photoshop CC for iPad hinges largely on Adobe's new format, Cloud PSD. Think of Cloud PSD like a Google Docs for PSDs. You can start off working on your desktop, continue them on your iPad or other supported Photoshop mobile apps, and collaborate with others who will be able to see the same revisions to the file as you do. The Verge managed to catch up Scott Belsky, Chief Product Officer, Adobe, to find out whether there would be a similar version for Android and a touch-first experience for Windows devices. Belsky didn't say anything in the affirmative aside from the usual 'we're exploring' remark. In the current iteration, the product is not exactly a 1:1 copy of the desktop experience but Adobe hopes to blur the line soon. Licensing details for Photoshop CC on the iPad will probably revealed closer to general availability. Nevertheless, it would be safe to assume that a desktop Photoshop CC subscription will get access to the full Photoshop experience on the iPad as well.